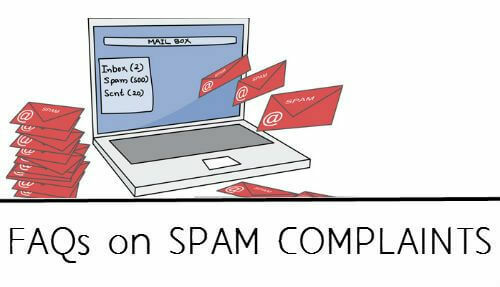 FAQs all about Spam Complaints. A spam complaint rate is the percentage of your clients who mark your email messages as spam. They do this to move you out of their inbox and into the junk folder. So what should your spam complaint rate be? According to most ESPs they want your spam complaint rate to be below 0.1%. This means that per every 1,000 email messages you send you should get less than 1 person sending you to their spam folder. When a user marks an email message as spam what happens? Your email messages will no longer be delivering to their inbox. Instead, they will be going to the user’s spam folder that is less likely to be opened. In addition to that, your sender score begins to drop. This hurts your reputation and overall deliverability. What happens if I exceed 0.1% spam complaints? When you exceed the recommended maximum spam complaint published by your ESP, risks are involved. Your account could be at risk of suspension. When you send spam or unwanted content to subscribers who complain about it, your ESP takes a reputation hit. It is their IP addresses that you are damaging. That is why they are very strict on their spam complaint policy. A feedback loop is a service provided by ISPs. They will forward complaints made by email recipients to the original sender. It is an important way to identify which subscribers have marked your messages as spam. This way you can remove them from future mailings. Why how does removing complainers from my list help me? It will help you save money, most ESPs charge you per the number of subscribers you have on your list. Plus, eliminating users who are not interested in what you are sending will help you improve higher rates of subscriber engagement. How does using XVerify help me lower my complaints? In addition to determining if an email address is a real account, XVerify can flag email addresses that have generated a high number of spam complaints about other companies. This will help you avoid damaging your reputation and keeping you in good standing with your ESP. Upon first thought, you may think just because these users complained about someone else’s email they won’t complain about yours. This is why we only add email addresses to our suppression lists that have consistently complained. These users do not understand how to ‘unsubscribe’. They simply mark emails as spam to remove them from their inbox. If you don’t want to eliminate them from your next email campaign, we have the next best idea. That idea is to segment them separately. Most complaints and unsubscribes occur because the user feels they have too many messages coming in. So, if you do choose to keep complainers on your list we would highly recommend that you only mail to them 1-2x per month or only send transactional related messages to them. Get started with email verification. We would love to have you test us out and see how many invalid email addresses we identify and how many complainers we flag. Give us a call at 1-866-903-9164 or send an email to sales@xverify.com so we can initiate an account setup for you.